For gently drying liquid concentrates into granulates or powders, a vacuum drying solution is the most energy-efficient process. Offering gentle drying with control over product characteristics, a bespoke vacuum drying solution can meet the most demanding requirements of the food or pharmaceutical industries. Devex vacuum dryers are designed for continuous loading of liquid or solid products and the continuous discharge of dried granulate. The end product is discharged in GMP clean room conditions ready to be further processed, making this ideal for food and pharmaceutical uses. Due to the vacuum, very low water evaporation temperatures can be achieved. This preserves aroma and product colour. Changes to the vacuum process enable control of bulk density and other product characteristics to your requirements. The Devex vacuum belt dryer is able to operate a vacuum from 10 to 80 mbar to suit all production requirements with a continuous belt surface of 200 to 300 metres. 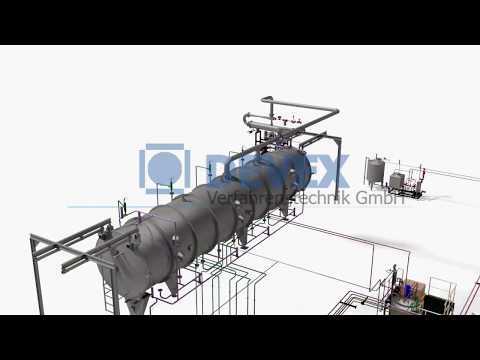 The Devex belt dryer is able to handle liquid products, concentrates and viscous products all whilst resulting in the best quality end-product. The fully closed belt system means no mechanical handling stress on product, no oxidation, and no environmental pollution.